In the ’80s, there was no shortage of pop coverage to inspire conversation in the playground, whether it was Boy George’s first appearance on ‘Top Of The Pops’, Michael Jackson’s ‘Thriller’ video or Matt Bianco being verbally abused live on children’s TV. Of course it really helped that there were only four terrestrial channels to choose from, breeding a feeling of community and sense of occasion. But one TV show absolutely guaranteed to get the creative juices flowing and rescue many a depressing Sunday evening was ‘Spitting Image’. Just a cursory look at a show from its mid-’80s peak leaves one stunned at the craftsmanship and production values on offer (especially as they only had a few days to write, build and shoot each episode), and quite honestly it shows up the state of television these days for the sad farce it is. There were some good musical spoofs too, composed by Philip Pope, fresh from UK comedy classic ‘Not The Nine O’Clock News’ and his parody band The Hee Bee Gee Bees, who even managed a few hits in the early ’80s. 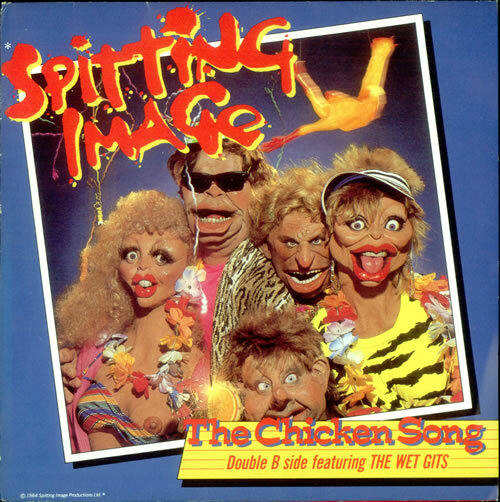 ‘Spitting Image’ also featured some memorable Phil Collins, ZZ Top and Madonna skits, and they even managed to rope Sting in to re-sing this. But ‘We’re Scared Of Bob’ is full of surprises and surely the best spoof. Its sheer potency is still a shock to the system. You also suspect that Sir Gandalf was watching, so unmissable was the programme in the mid-’80s. Why isn’t there anything like this around now? Oh, lack of money and talent, probably. A show like ‘Spitting Image’ also highlights the paucity of genuinely interesting musical (and public) figures these days. This entry was posted in Articles, Comedy Records, Live Aid, Spitting Image, TV Shows and tagged bobgeldof, cyndilauper, heebeegeebees, liveaid, madonna, philippope, spittingimage, sting, usaforafrica, we'rescaredofbob. Bookmark the permalink.